It was a very choppy, but bearish week for US equities. 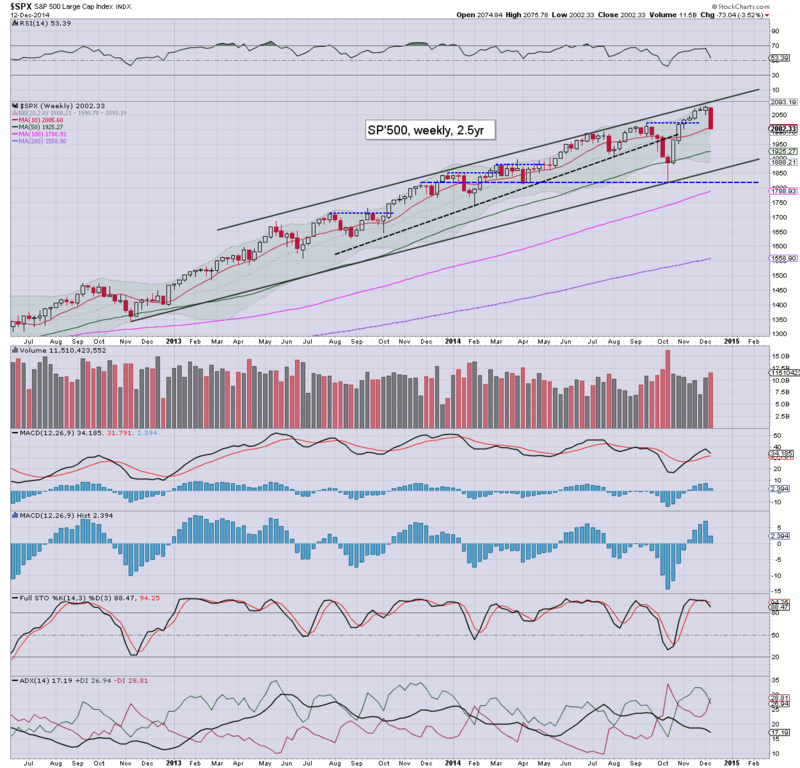 Net weekly declines ranged from -4.3% (NYSE Comp'), -3.5% (sp'500), to -2.5% (R2K). Despite the significant declines, outlook is for renewed upside in the remainder of the year... if not all the way across spring 2015. 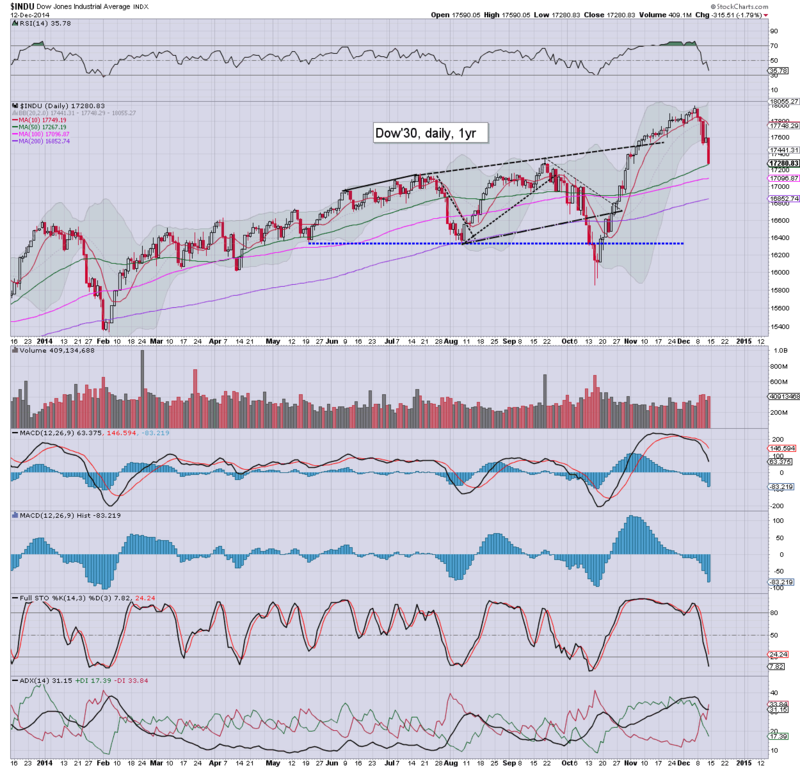 A major decline of 73pts (-3.5%) for the sp'500. The weekly close of 2002 is interesting in that it makes for a very natural flooring area, not least with the 50dma lurking close by. 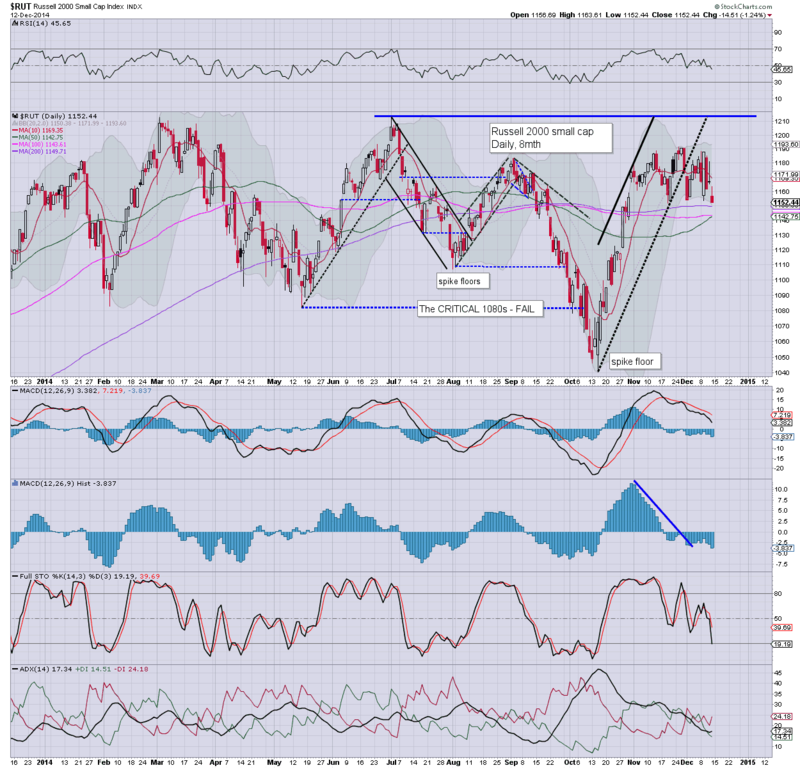 Best case for the equity bears is either 1980 (38% fib retrace) or 1950.. where the 200dma is lurking. However, both of those targets seem quite unlikely, not least with price action providing regular powerful bounces. Underlying MACD (blue bar histogram) cycle is set to turn negative at the Monday open.. so there will be some downward pressure early next week. Best guess... market floors around sp'2000... and then battles upward into year end... with the sp'2100s in January. 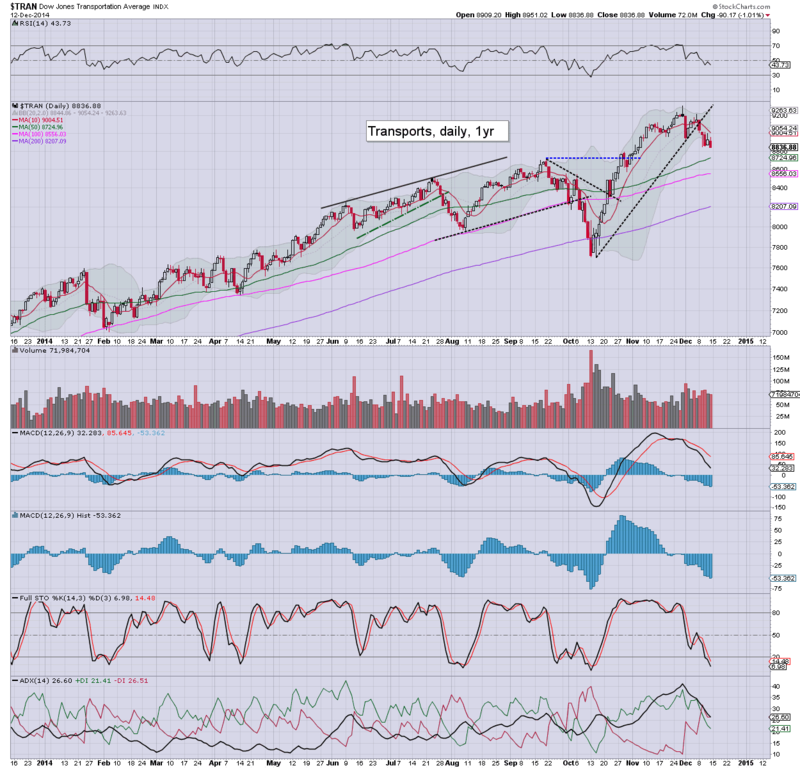 The tech declined by -2.7% this week, but considering the hyper-ramp from mid October, this is only a minor retrace. First support is around 4600.. which is about 1.5% lower and could be suggestive of sp'1980.. before the next major multi-week up wave. The mighty Dow fell 678pts (-3.8%) this week. 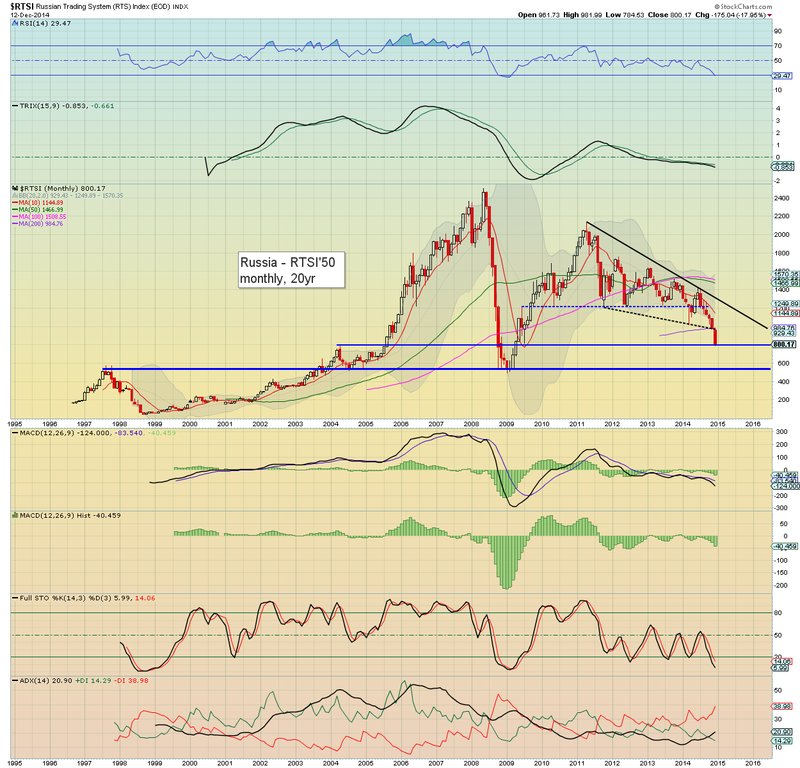 Critical support is the big 17k threshold. Unless the equity bears can break under there... this is just a minor retrace of the giant Oct' ramp from 15855. The master index was especially weak, falling a considerable 469pts (-4.3%) to 10500. Underlying MACD cycle has turned negative. The giant 10k threshold is an obvious level for the equity bears to aim for, but considering the broader market... a 'critical failure' of 10k looks highly unlikely. 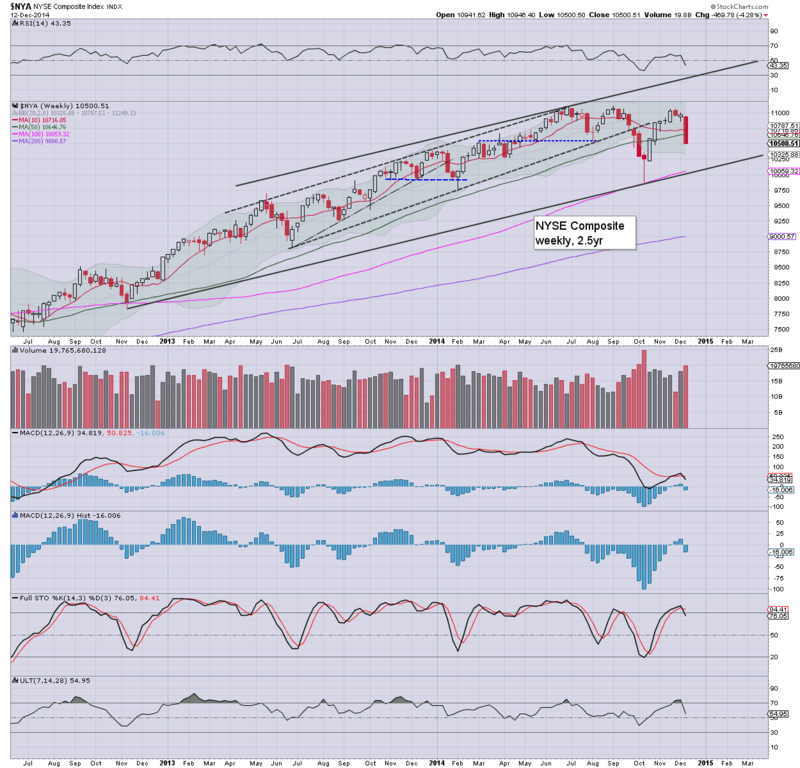 With the NYSE Comp' back down to 10500 , a yearly close in the 11000s looks overly difficult. The second market leader lost 30pts (-2.5%) this week. Interestingly, the R2K is still holding soft support of the 1150 threshold. Breaking a new historic high (>1213) - some 6% higher, is certainly viable by late Jan/early Feb. Any monthly close in the 1220s will signal a massive new up wave is underway, much like the transports in early 2013. The 'old leader' lost 315pts (-3.4%). Next soft support is around 8800.. that is just 0.5% lower. 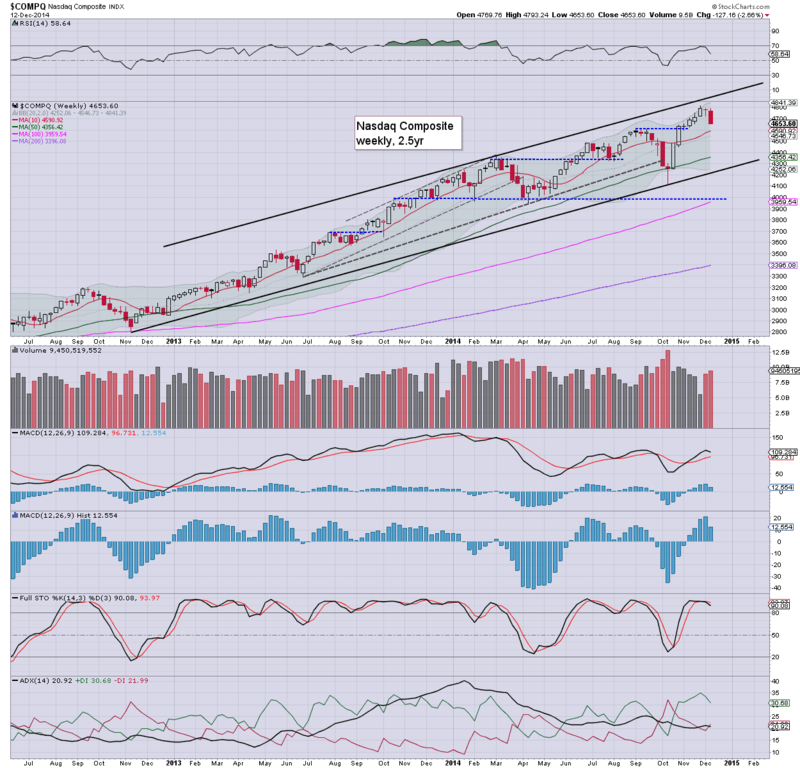 The Oct' low is still a clear 1000pts lower.. and does not look in danger of being tested for a very.... very long time. So, for most indexes, this was the first net weekly decline since mid October. The size of the declines is pretty impressive - as also reflected in the VIX.. back in the 20s. 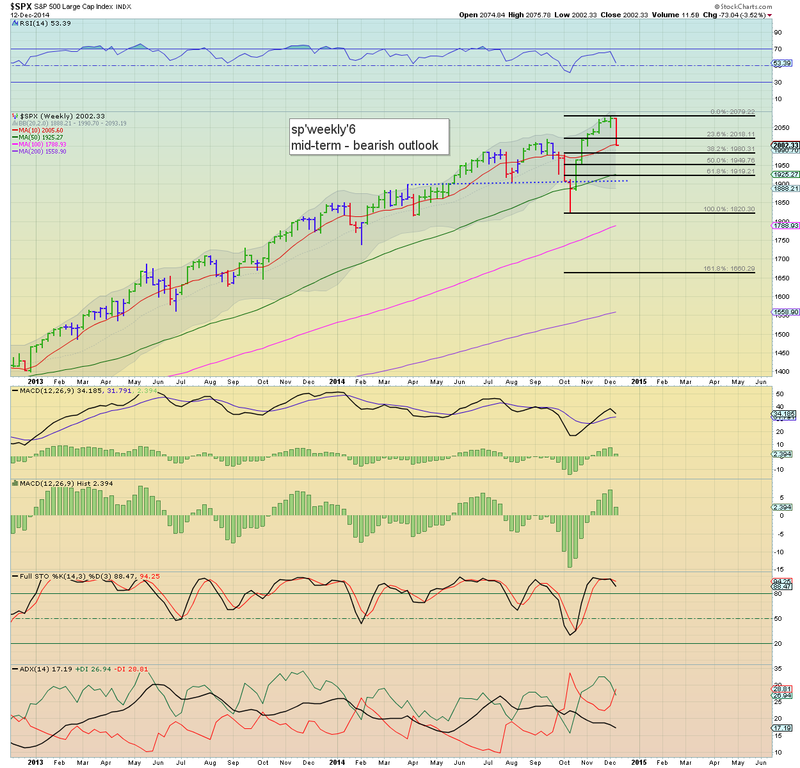 However, considering the hyper-ramp of sp'1820.. to 2079, this is very likely just a moderate retrace. Equity bears at best might manage sp'1990/80s in the first half of next week, but it won't likely last. There is very natural cyclical and seasonal factors that are highly suggestive of upside into year end. With oil prices smashed lower, I'm very much holding to the notion that Mr Market has yet to fully appreciate the positive economic implications for not just the US, but the world economy. The sp'2100s look a given by late January... and frankly.. I see little reason why the market can't battle higher into late spring... to the 2300s.. and beyond. Next week has quite a few things... and is notably, the last full trading week of the year. W - CPI... with the weeks big event: FOMC announcement. Market is expecting only a subtle change in policy-statement wording, with the removal of 'extended' in terms of low interest rates. Yellen will have a press conf. shortly after the 2pm announcement. F - no data, but it will be quad-opex.. so expect some serious price chop.. especially into the weekly close. The week concluded with another wave of rather significant declines, sp -33pts @ 2002, which made for a net weekly decline of 73pts (-3.5%). With VIX settling the week at 21.08... the crash callers will no doubt be crawling out of the woodwork again. *the first closing weekly red candle since early October. It has been a long week.. but a VERY interesting one.. lots of strong bounces... but much more significant down waves. With the VIX back in the low 20s, I truly understand why some will be getting especially bearish for the remainder of the year.. and into early 2015. However.. a move to sp'2000 was expected.. along with VIX 20s... and now that we're here.. its a case of how long until the next up wave begins. Best guess.... a few days of chop around sp'2000... and then up.. once the FOMC meeting is out of the way. 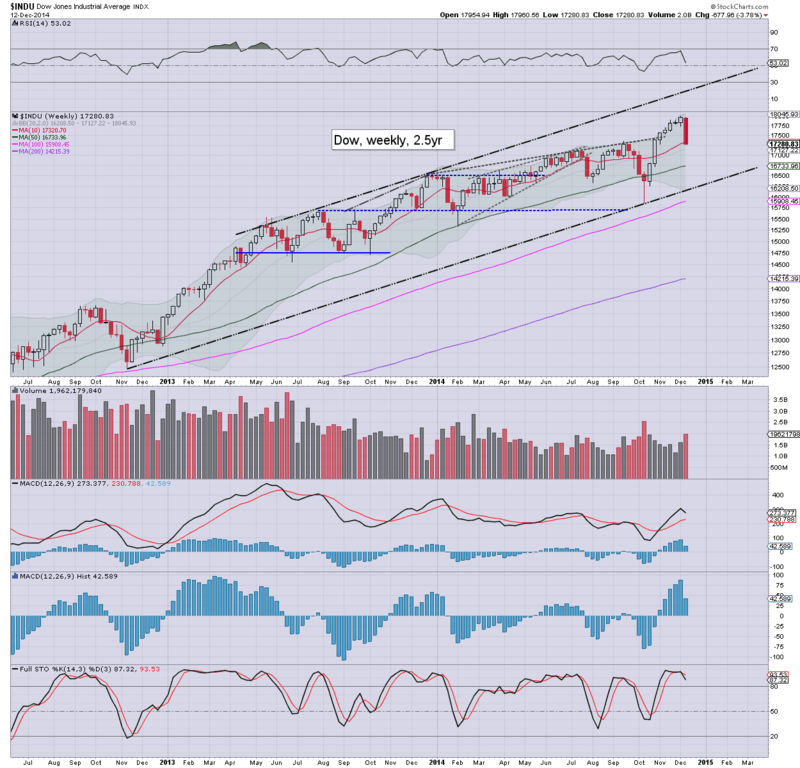 A weekly close on key support of 800, but with an intra day low of 784. The door is now open to the 500s, but a bounce is going to happen if Oil starts a multi-week rebound - which I'm guessing it will. 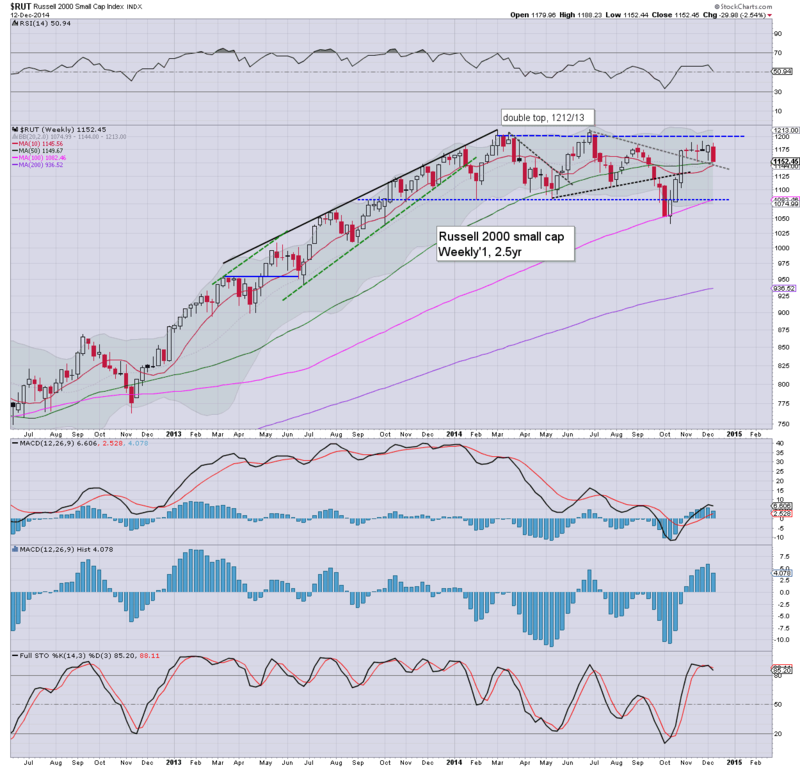 US equity indexes all saw significant declines to end a bearish week, sp -33pts @ 2002. The two leaders - Trans/R2K, settled lower by -1.0% and -1.2% respectively. 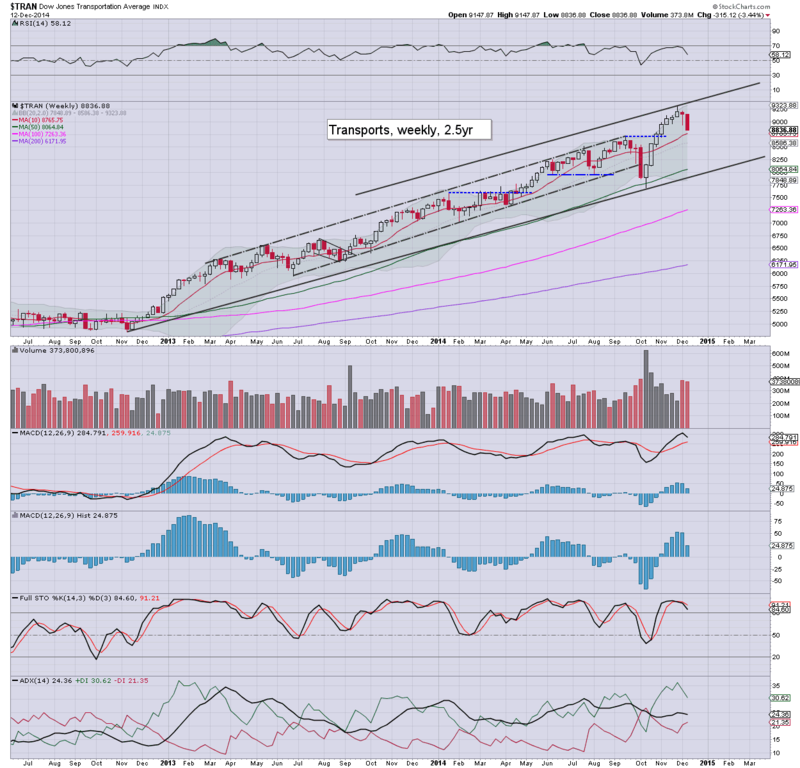 Near term outlook is for the market to build a floor around sp'2000, and then climb into year end... and beyond. Suffice to say... major declines to end the week, and for the equity bears, this was one of the best weeks of the year... as also reflected by a weekly close in the VIX of 21.08. 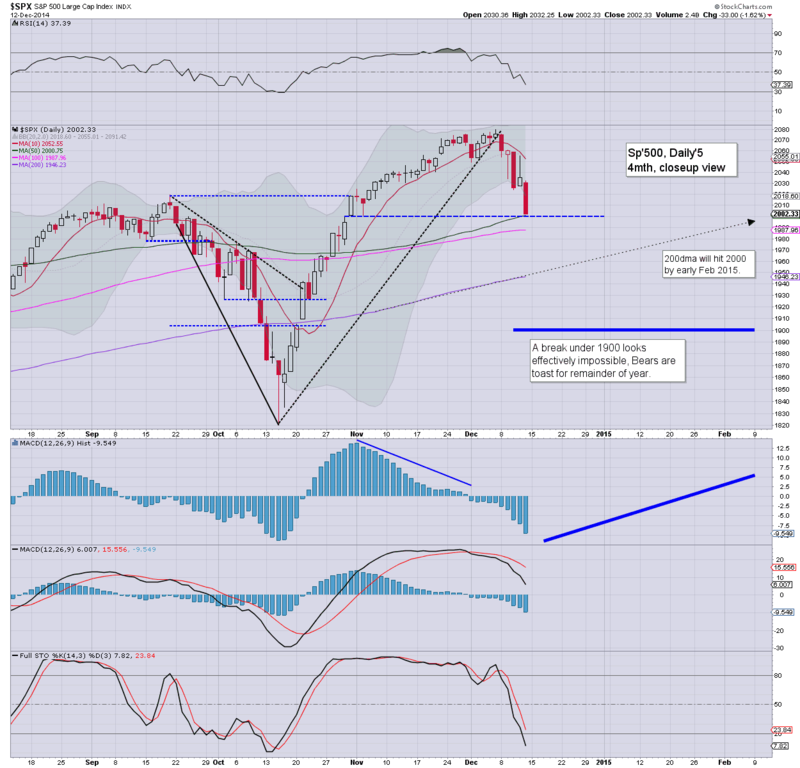 A decline to sp'2000 was the primary target.. and we're about there. A key floor looks likely to be built in the first half of next week.. and then its a case of when the sp'2100s will be hit... not if.